The Wafra Living residential complex, located in Jabriya Kuwait is 6468 m2, offering three categories of rented apartments, the difference between them lies from the quality of finishes, type of facilities and their size. This type of exclusivity allows for a greater return on investment while at the same time breaking down the scale of the complex making it more personal to the individual resident. It is in this experience that AGi architects aim to create a quality environment that differs from other residential developments in Kuwait, and is based on both international and regional cultural influences. To achieve this, the conception of a distinct “framework” and identity for Wafra Living has been pursued as one of the principal objectives. Privacy, natural light and communal spaces One of the main objectives of the design is not only to maximize the privacy for the tenant community, but also to allow abundant natural light to enter, and the creation of both interior and exterior communal spaces. The success of this lies in an L-shaped building which follows the edge of the street at its north and east boundaries, and a high-rise block at the rear, enhancing the definition of the more private back street. Openings in the front facade have been made, providing better views from the apartments situated on the lower levels of the rear tower. At the same time, the facades adjacent to the neighboring buildings have been completely closed off, blocking undesirable views and increasing privacy for the tenants. 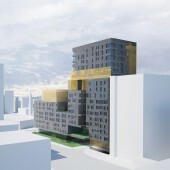 To improve public/private relationships in this vertical development, the ground floor is open to the surrounding neighborhood using a 316 m2 commercial zone. The necessary security controls are ensured through access points related to specific parts of the building. As for vehicle access, there are three points of entry located around the plot to reduce the traffic during rush hour times. 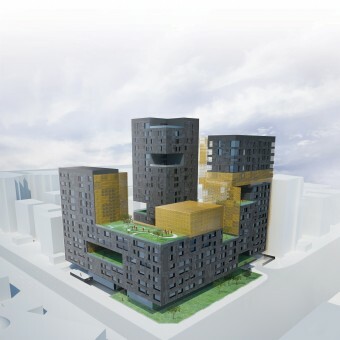 Elevated square, gardens, open spaces and facades protected by a “veil” The mezzanine level has been placed at six meters above the ground level – A High Square – as an elevated ground floor community space for the tenants. The decision to raise it was based on the need to create a safe social gathering space that acts as a buffer from the busy street. It will also minimize the noise and create a private communal space for the families. It is here that the swimming pools, gymnasium and sporting facilities can be found. On a lower level, there is a multi-purpose hall. This space can be completely open to the public, totally private or a combination of both. It is the only space where the community has a direct connection with the street. Apart from the Elevated Public Square, various gardens and vertical open spaces have been designed which provide various gathering areas for the community and to bring in ample light into the different units. The Viewing Point, on the edge of the L-shaped building, is a large opening in the facade providing the rear tower apartments with views. The Sky Deck is an open-air roof garden with a mini golf course and may be used in winter for leisure activities. Alternatively, the Gym Terrace is a more private space, catering specifically to the user needs of this part of the building. As one ascends through the building, the access to the communal zones becomes restricted according to the apartment category. The network of stairways and outer platforms, help to connect these spaces and can be used as pathways, protected by a “veil”, for walking or exercise. This “veil” is a unifying element throughout the project which is perceived more as a constructed space with various uses rather than an aesthetic facade cladding. It defines the whole complex starting from the first floor, and spreading like ivy both vertically and horizontally complementing the rest of the facade. The “veil” has been placed in the L-shaped building, which allows the positioning of the main living spaces of the apartments to face the street, while the service areas – kitchens, bathrooms etc – face the inner courtyard. The Veil rises at the inner facades, climbing over the roof terrace to encompass various communal facilities. It offers the apartments at the rear greater privacy, and better views for the apartments facing it. City master plan strategies allow a large scale complex to be situated in this plot, so the challenge for our team has been the creation of an architecture that responds both to the scale of the city and the needs of the users, addressing cultural and social issues of privacy, division of tenants and their service space, as well as issues of community spaces and identity. We seek to create a difference type of Landmark that becomes part of the experience that relates to the intimate and personal scale of its residential community, rather than a physical monument that relates to it. Thus leading to a challenging design that will provide optimal residential units, with a possibility of the widest range of rentable models that vary depending on the needs of the end user. Wafra Living is designed as a complex with both indoor and outdoor areas, combining comfortable, easy-to-maintain residential space with common-use facilities to enhance leisure and social interaction, recognizing it from other residential complexes in which communal gathering spaces are a rarity. 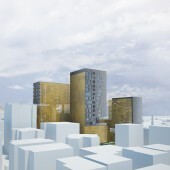 Coping with privacy needs and security, the complex also intends to integrate within its environment, so that it is not understood as an isolated compound, weaving relation threads with the rest of the city: a reference as a unique environment, memorable public spaces and a vibrant mix of tenants, in a world-class development. Wafra Living Residential Complex by Agi Architects is a Nominee in Architecture, Building and Structure Design Category. Wafra Living Residential Complex by Agi Architects is Winner in Architecture, Building and Structure Design Category, 2011 - 2012. Did you like Wafra Living Residential Complex? Help us create a global awareness for good architecture design worldwide. Show your support for Agi Architects, the creator of great architecture design by gifting them a nomination ticket so that we could promote more of their great architecture designs.